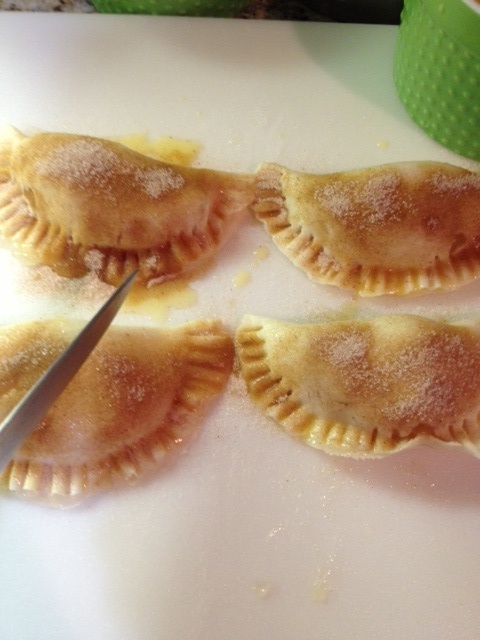 Here is a quick little recipe on how to make delicious apple pie pockets. No need for that pie dish. These are great for grab-n-go moments that we all have. Place one pie crust on to the lightly-floured cutting board. 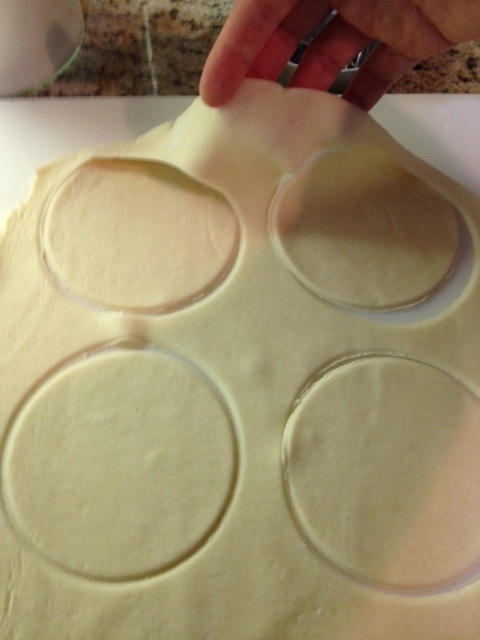 With the cookie cutter or ramekin, cut out four circles. 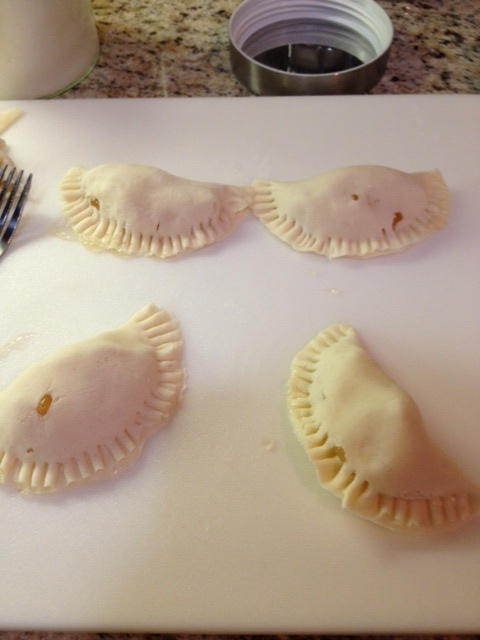 Peel the excess dough and set aside for the second batch of pockets. Place just enough filling to be able to close the pocket without it oozing all over. Just as a warning, there will be some filling that will come out when you work on the next step. That’s okay, it will still turn out fine. Pull the bare half of the dough cutout over the apple-filling side. This can be a little tricky, but with some patience and a little finesse, this can be done! Mix the cinnamon and sugar together; this will be sprinkled on top before the apple pie pockets go in to the oven. The egg wash is a great glue for the sugar, and one more thing, very, very important, be generous with the amount of cinnamon-sugar sprinkle! 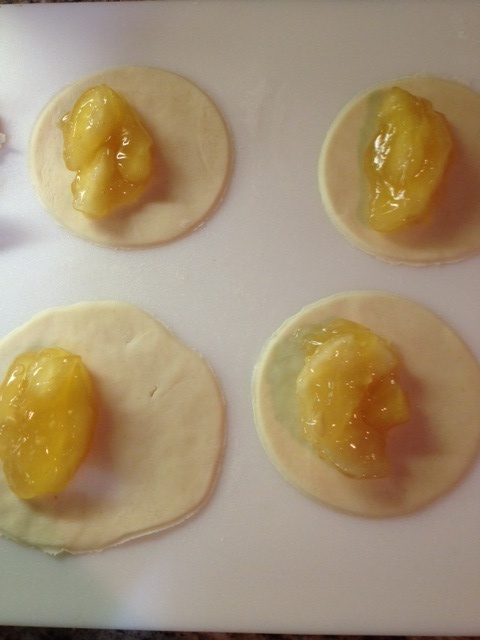 Place the parchment paper on to a cookie sheet, then place the pie pockets on to the parchment paper. 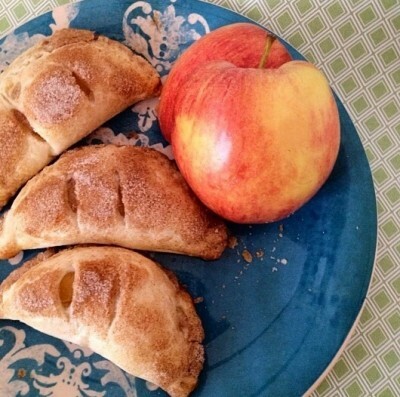 Bake the apple pie pockets for 15 minutes. And we have ourselves some apple pies to go! How fun and easy was that?!? 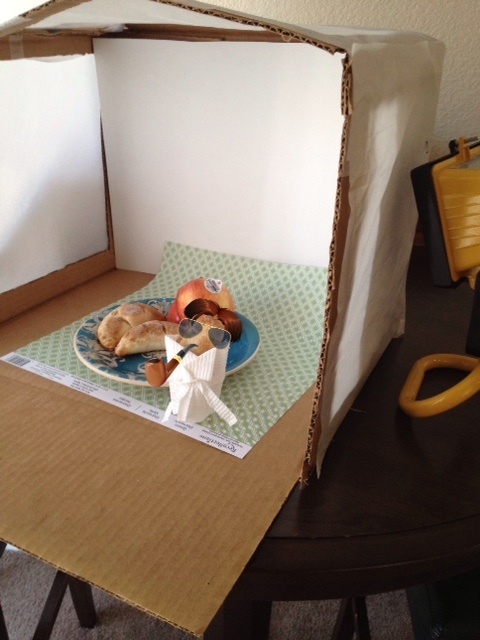 Here is some behind-the-scenes footage I promised! 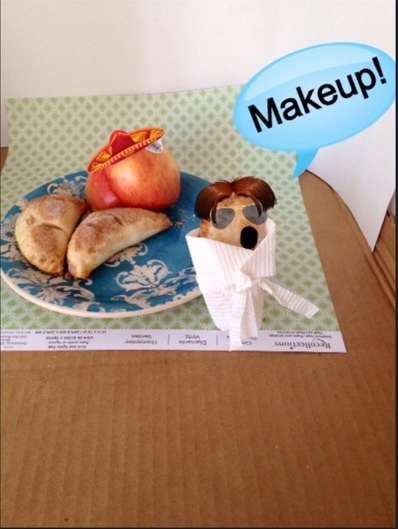 And yes, this pie pocket is wearing a robe made from 100% paper towel! Hehe! Too cute! Thanks, everyone, for visiting PeopleTreats! Don’t forget to like if you like, and new followers are always welcome! 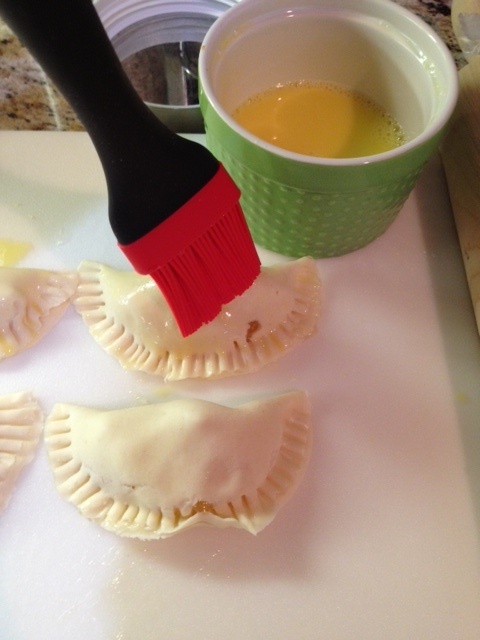 This entry was posted in Apple Pie Pockets, Home, Main Meals and tagged Apple, apple pie, apple pie pockets, baking, cinnamon, dessert, Food, pie crust, Recipe, snack, sugar by mrewilson. Bookmark the permalink. 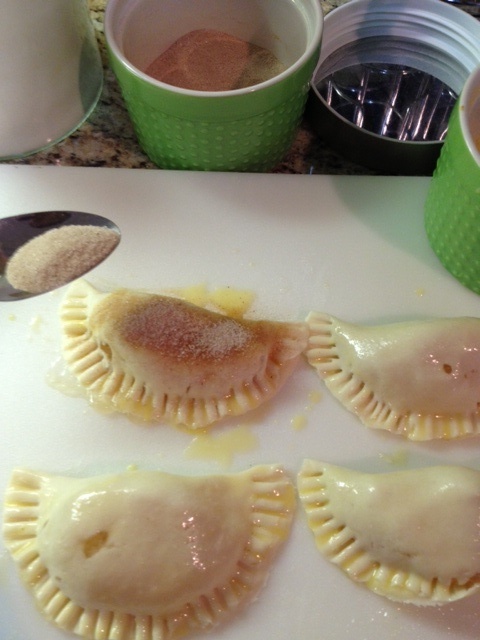 I wanted to share this great idea for an on-the-go hand pie we will probably make to take with us camping! 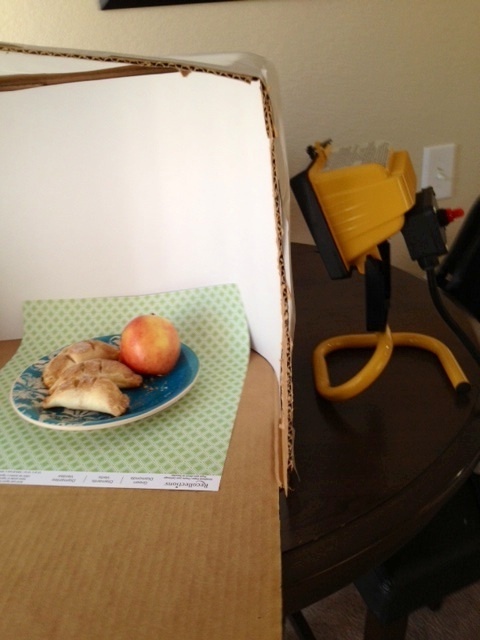 I am so thrilled to see that you reblogged my apple pie pockets! Thank you! These little pies will be great for your camping trip! This will be great for camping! We can make them up ahead of time and heat them up over the fire if we want them warm! I had these pockets in my fridge for almost a week, and I just heated them up in my microwave, and they still tasted great. I’m sure heating these up over the fire will work fine. Maybe wrap them in foil and set on a pan. How fun! Have a great camping trip :)! Those look so yummy. Looks like a great recipe. Thank you so much. I had a lot of fun with this one, and it was probably the easiest recipe, only three things needed. 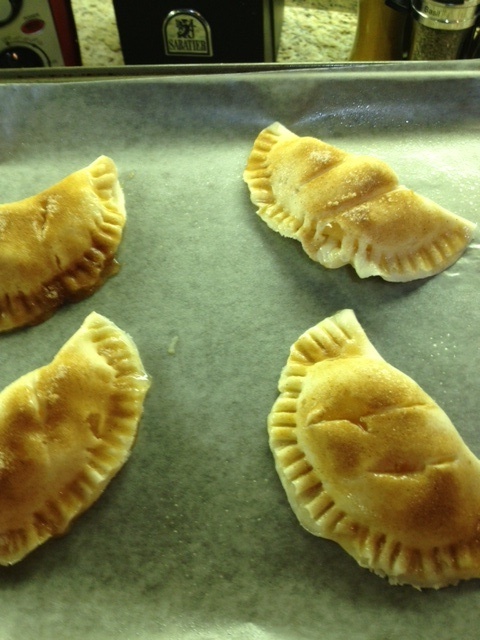 The apple pie pockets look delicious. I love the behind the scenes footage. It’s fun to see how the photos were taken. Thank you so much. I had a lot of fun with this post 🙂 yeah, a homemade light box worked perfectly. I’m still pretty new to food photography, so it’s been an interesting process. Thanks for checking out PeopleTreats! Anytime! Thx for stopping by :)!